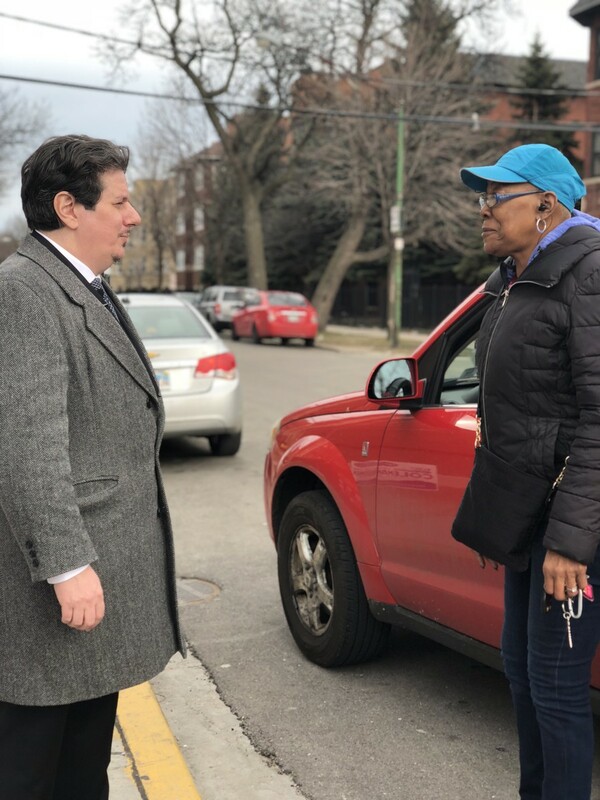 Piemonte spoke to a constituent who described herself as "The Queen of 71st Street," a long time Fifth Ward resident who intends to vote for Piemonte because she is ready for change. 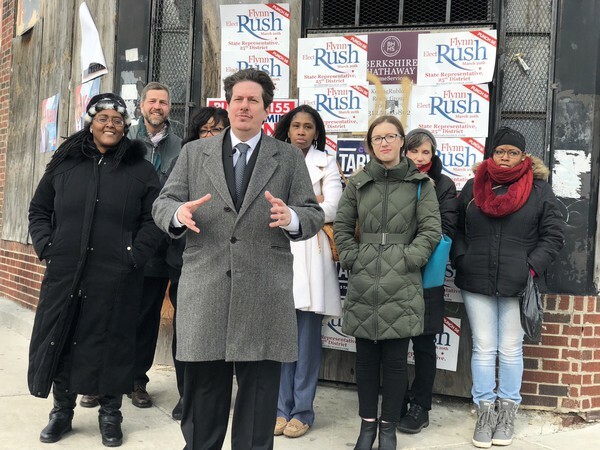 Gabriel Piemonte, former editor of the Hyde Park Herald, announced his candidacy for Alderman of the Fifth Ward this morning on the corner of 71st and Merrill while braving the cold with his supporters. Piemonte made the announcement in front of an abandoned storefront, using the scene as an example of the economic struggles that have taken place in the fifth ward. “We’re here today on 71st Street not only because my campaign headquarters are going to be just a few doors down, but also because we believe that this is emblematic of the consequences of exclusive leadership,” Piemonte said. As Alderman, Piemonte hopes to return businesses into local hands. “Block after block, storefront after storefront [there are] empty, vacant storefronts that could be, instead, opportunity,” Piemonte said. Gabriel Piemonte announces his candidacy for Fifth Ward Alderman at the corner of 71st Street and Merrill. Piemonte was surrounded by family, friends, and colleagues supporting his campaign, and his announcement drew attention from local passersby. One woman got out of her car after being informed of the occasion. Walking up to Piemonte, she affirmed he had her vote. She told Piemonte that, as a long time Fifth Ward resident, she knew every store owner and business on 71st and had watched it become riddled with vacancies under current Alderman, five-term incumbent Leslie Hairston’s tenure. Piemonte is the first candidate to challenge Hairston in advance of the citywide Aldermanic elections in February 2019. Hairston received 52.5 percent of the vote in 2015. This was 33 points ahead of the next candidate, but was only 2 percent more than the vote needed to call a run-off election. It also represented the lowest percentage for Hairston since she first forced the ward's incumbent alderman into a run-off in 1999. This article was edited after publication to reflect the fact that Hairston registered 30 percent of the vote in her first run for fifth ward alderman, successfully denying her opponent 50 percent of the vote and forcing a run-off. Piemonte will oppose five-term incumbent Alderman Leslie Hairston, who has refused to endorse a Community Benefits Agreement (CBA) for the Obama Foundation.